Lena Spinks, daughter of Abner and Mattie Spinks. 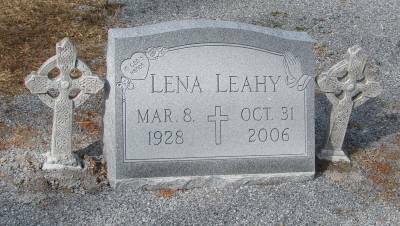 Lena Leahy, 78, of Woodstock died Tuesday, October 31, 2006. Services will be 1 p.m. at Old Macedonia Campground, with the Rev. Larry Johnson officiating. Survivors include two sons, Jerry Henderson and Don Henderson, both of Canton; one brother, Hubert Spinks of Norcross; and one grandchild.